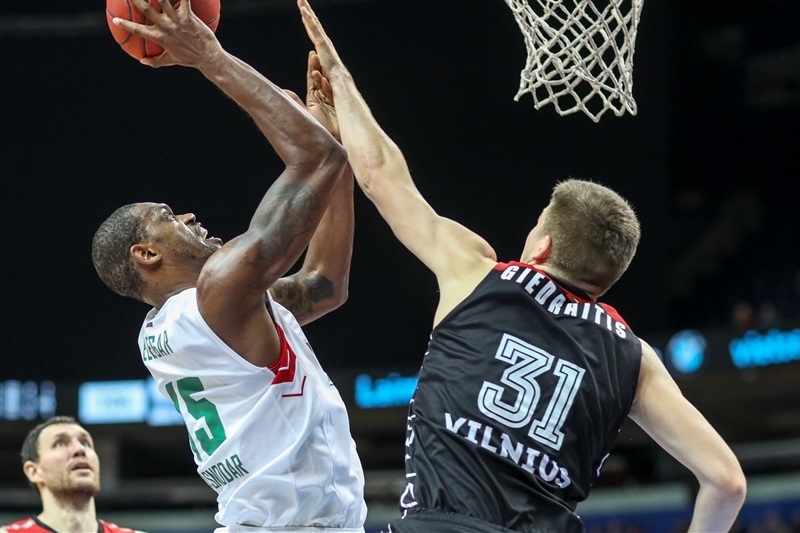 In a battle of former EuroCup champions that went into overtime, Lokomotiv Kuban Krasnodar remained undefeated with 85-93 road win over Lietuvos Rytas Vilnius in the Round 3 opener on Tuesday. 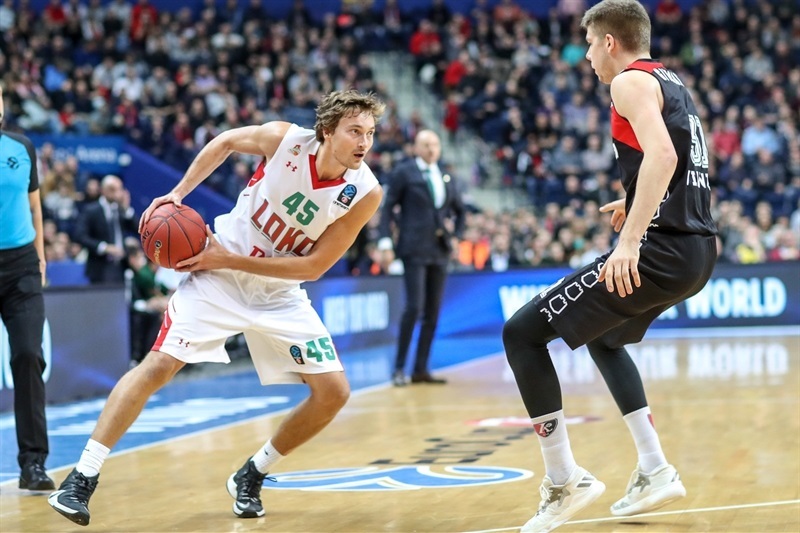 Lokomotiv improved to 3-0 and remains in first place in Group C, while Rytas suffered its second loss in as many home games in the young 7DAYS EuroCup season to drop to 1-2 record. The hosts had an 11-point lead in the third quarter, but Joe Ragland fueled the Lokomotiv rally and put the visitors in front. 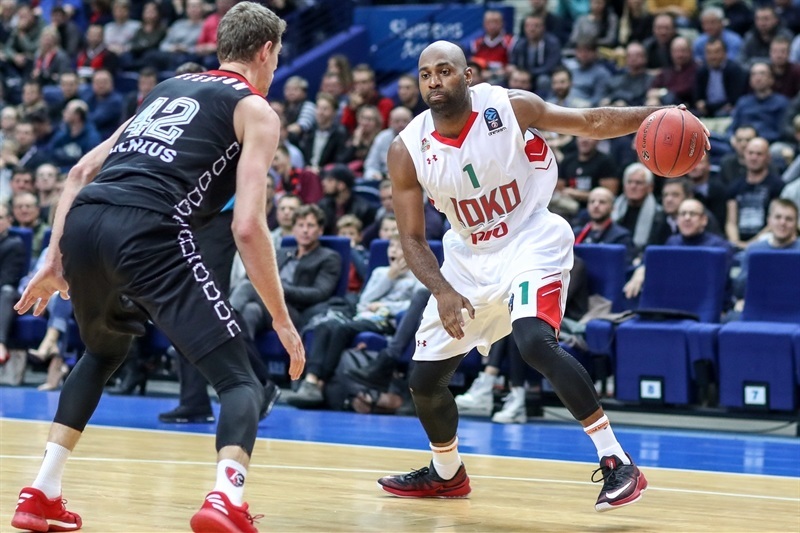 The hosts hit 3 triples in the final two minutes of regulation to send the game into an extra five minutes, but Lokomotiv scored the final 8 points of the contest to pull out a victory. The visitors had six scorers in double figures, with Ragland scoring 21 points and dishing 9 assists. Frank Elegar collected 17 points plus 10 rebounds, and Mardy Collins had his usual all-round contribution with 13 points, 7 rebounds and 4 assists. Brian Qvale added 12 points, Chris Babb 11, and Ryan Broekhoff 10 in victory. 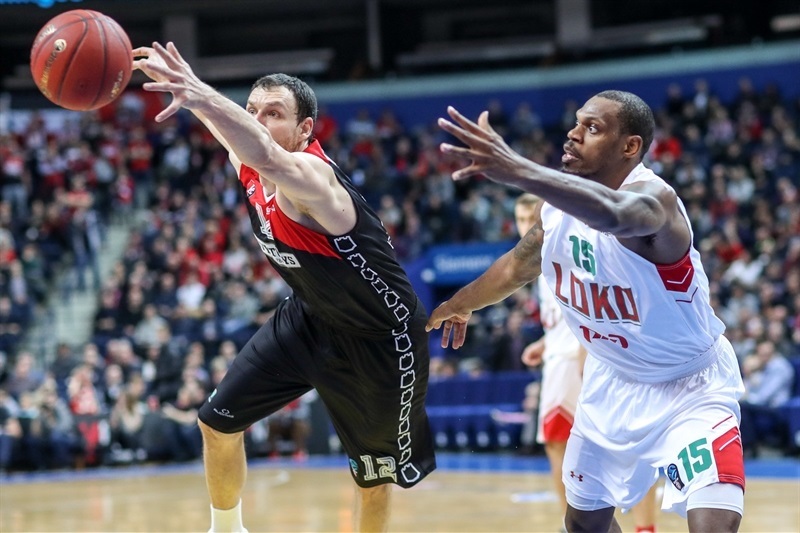 Loukas Mavrokefalidis paced Rytas with 22 points and 7 rebounds, Rokas Giedraitis netted 19 points, and Mindaugas Lukauskis had 11 in defeat. Lokomotiv scored the first 5 points of the game, but Rytas countered and took a 9-5 lead with a run that included a triple from Lukauskis. 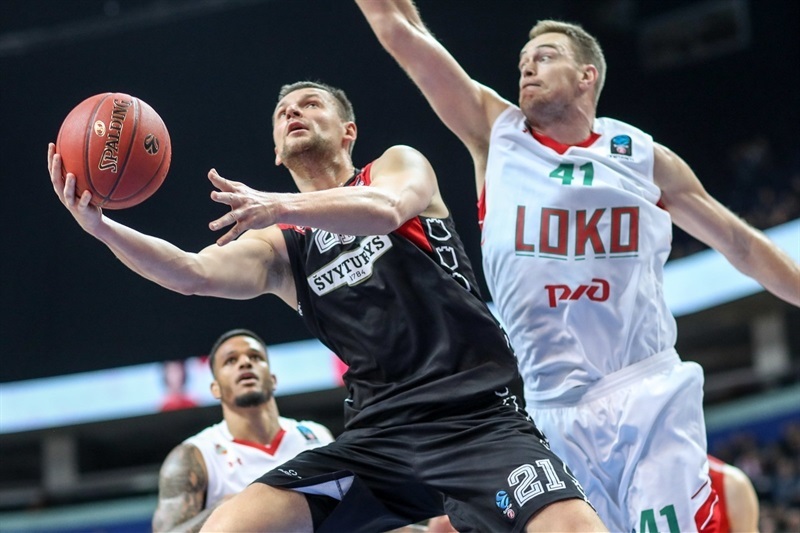 The visitors stopped the bleeding, and the teams traded leads as Pavel Antipov and Giedraitis traded three-pointers. A three-point play from Elegar tied the score at 16-16, but a tough basket-plus-foul from Giedraitis helped Rytas end the first quarter up 21-18. 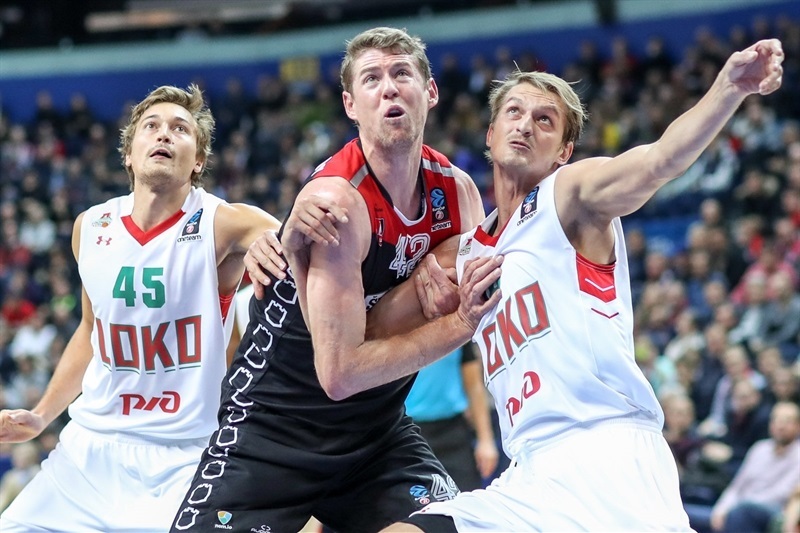 Lukauskis hit a floater and a triple in the first 39 seconds of the second quarter to open a 26-18 margin, but Lokomotiv did not need much time to catch up as Broekhoff and Qvale combined to score 9 points and cut the deficit to 30-29. A transition triple from Travis Peterson kept the hosts in front, but Elegar and Qvale each rejected a shot, which led to a pair of fastbreak baskets, before a two put-back baskets helped Lokomotiv to a 37-39 advantage and the teams went into halftime all even at 43-43. The hosts started pulling away early in the third quarter. Robert Carter started things with a triple from left corner, and Giedraitis soon added one from the right corner. Close-range baskets from Jimmy Baron and a three-point play from Robert Carter opened a 58-47 lead. After a timeout, however, Lokomotiv was sturck right back, with Ragland stringing together 6 points and then adding a triple that capped a 0-11 run and tied things up once again. After 30 minutes the visitors led 64-61, but Lokomotiv used a better start to the fourth, and a layup from Collins to go in front 64-65. The teams traded close-range baskets, before a triple from Babb made it 68-72 midway through the fourth. 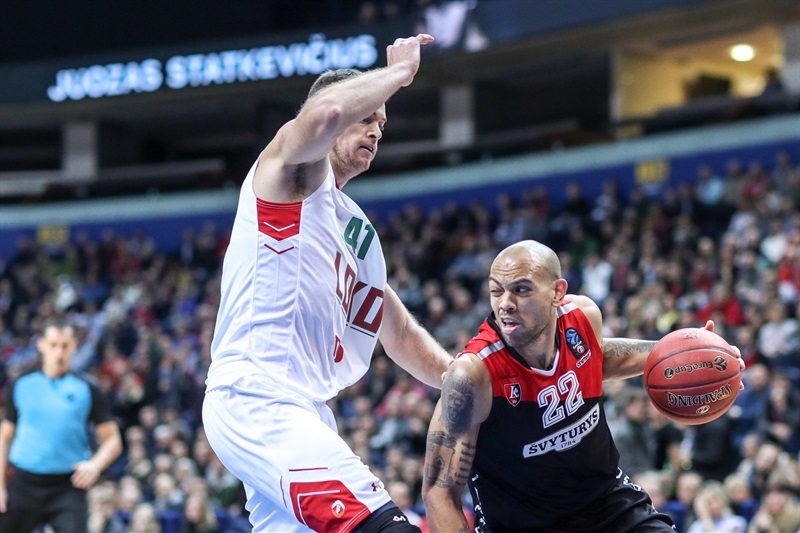 Rytas replied through Giedraitis and Mavrokefalidis, but Collins nailed a three-pointer and a long jumper to make it 72-77. 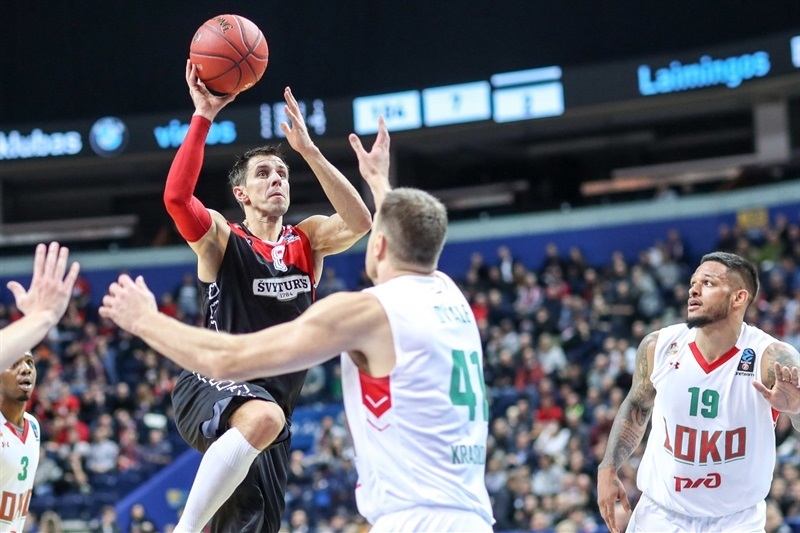 Giedraitis hit a triple that kept Rytas close, and after Elegar tipped in a lob pass from Ragland in the final minute, Mavrokefalidis hit from behind the arc to make it 78-79 with 21 seconds remaining in regulation. Babb made a pair of free throws, before a step-back three-pointer from Giedraitis with 11 seconds to go in regulation sent the game to overtime, 81-81. In the extra session, Lokomotiv grabbed a slim lead right away and then used baskets from Elegar, Collins and Ragland to take an 85-89 lead with 75 seconds to go. After another defensive stand, Collins connected with Elegar for another close-range basket, and the visitors prevailed to stay undefeated. "It was a tough game. We were not playing bad at all. Our problem was that we did not have a full team, especially at playmaker with Chris Kramer still injured, and I think that was the key to victory. We did a great job, spent a lot of energy, and had a great effort. 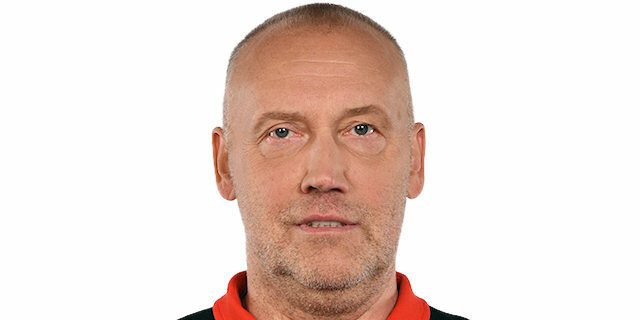 I want to thank our guys, and surely congratulate Lokomotiv. They are playing well, they were little bit more disciplined that we did, and won." "We were supposed to finish the game before the overtime. We had a tactical foul to use at the end of regulation, but unfortunately we did not. But it is a good win, especially in this gym and in this atmosphere. And it is important for us because we come off a loss in the VTB League. It is always good to win and gain confidence. In overtime, we played small ball and I think that hurt Rytas the most. 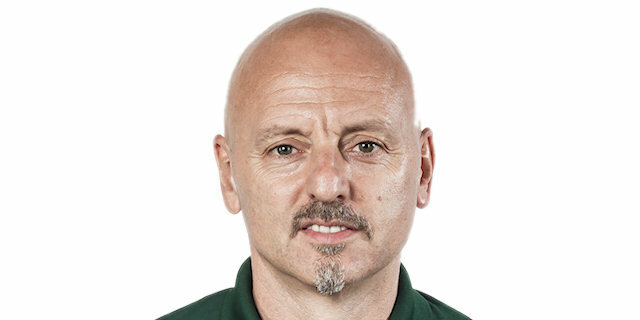 Mardy Collins found his rhythm, which he did not have during the game, which was important and that helped us a lot."